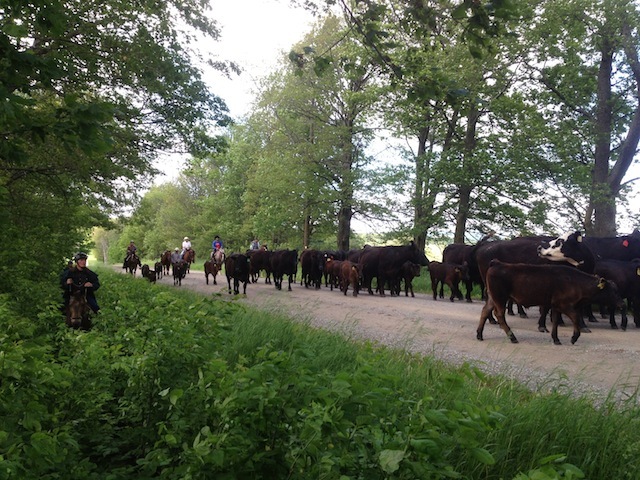 The Spring Sort 'n' Move drive requires riders who have worked cattle with us before. We will sort out a smaller herd with their new babes and get them ready for the South Ranch Drive. May not seem like a long trip to you, but because the babes are so young and new to being moved, this drive requires patience and capable horsemanship! The fee for the Spring Sort 'n' Move is $150.00 + HST - includes the drive and a meal back at the Ranch! Be ready to ride at 10:00AM - DO NOT BE LATE! We ride rain or shine. 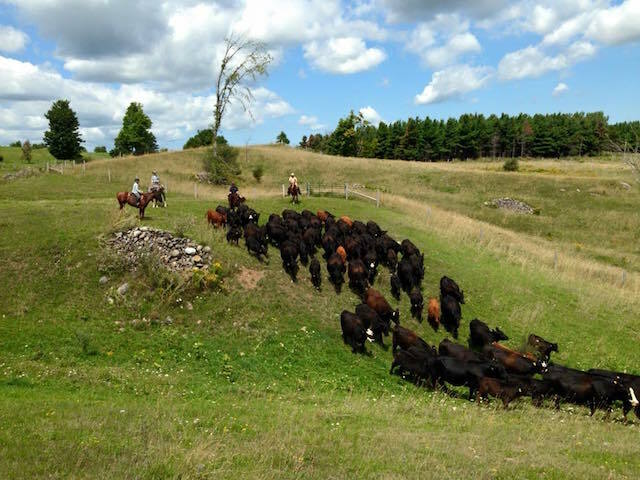 We have set the dates for our ever popular off-ranch cattle drives for this season! The fee for our Drives are $150.00 + HST - includes the drive and a meal back at the Ranch! Be ready to ride at 9:00AM - DO NOT BE LATE! We ride rain or shine. Ask us about staying over the night before at discounted B&B rates! Because our cattle drives are so popular, we have set up a few on-ranch cattle drive dates. These are for people who want to learn about what it takes to sort and move a herd of cattle including the responsibility of the various roles played by the crew. If you want to teach your horse that cattle are not going to EAT them, we can provide you with Private Cattle Sessions. Using the strength and trust of our horses alongside yours, we provide you with the ability to calmly close in on the herd with an equally quiet way out! Talk to us about setting your horse up for success! Saturday August 10th, 2019: Join us at Trail Ride for Breast Cancer at the Dufferin County Forest! If you would like to ride in this very important fundraiser, why not join the Rawhide Crew! Can I Book a spot on the Breast Cancer Ride? Can I Book a a County Forest Ride! We will work out dates and times! If you have your own horse, why not join us on a County Forest Ride - we will guide, you pick the group you want to ride with! All we ask is that you are an OEF member!